My plan for yesterday was to take care of the car and pick up the book at Sweet Home. I was at Honda yesterday morning before 8. I knew I needed work as well as an oil change. I ended up with the ninety thousand mile check plus some more....cha ching..CHA CHING. well better than needing a new car, I need to take care of this one. It is a good thing I had a book with me as it was an almost 4 hour wait. But at least it is done. About 11 Cindi called me and asked about Sweet Home. I told her what was going on and I would catch up with her when I was done. You know it is bad when the print out is 3 pages long!! I picked up Cindi and we headed out to Sweet Home. 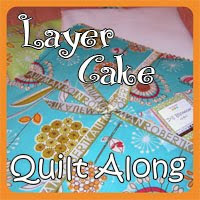 I got the book Layer Cake, Jelly Roll and Charm Quilts by Pam and Nicky Lintott. It is their second book, the other being the Jelly Roll book. 17 new possibilities in this one. I am still just looking through it to decide which one I want to do first! Of course, Bad Melisa being true to herself has new stuff and I had no will power and succumbed. 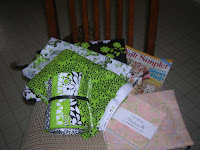 I seem to be in one of my bright phases and picked up a fat quarter selection of Sorbet by Moda. I need to find a project because I am really loving this line. You can't miss it, it is right in front of you when you walk in!! As we were leaving, who should walk in but Gretchen. She got the book email too! I guess Becky was there earlier!! The Head Thimble was upstairs teaching a class, so we all invaded her space for a few minutes and had some laughs....coffin quilts revisited...and how about a quilted chastity belt????? I intended to be productive when I got home but ended up finishing the book. People of the Book by Geraldine Brooks. I really enjoyed it. I am so excited!! Got an email this morning from Melisa of Sweet Home fame. The book Gretchen, Becky and I have been waiting for has arrived! It is by the authors of our current fav Jelly Roll book. I guess I will be going out to Conyers today. But first I have to get the oil changed on the car. I want to work more on the backing for Fresh this weekend too. I knew it was just a matter of time until Willie moved onto the bed at night. As I headed off to bed last night, I did what I always do: "come on boys, let's go to bed". Spooky usually comes right away, Henry waits awhile. Last night Willie came galloping into the bedroom. That is his usual speed-gallop and on the bare floors even his little body is loud. 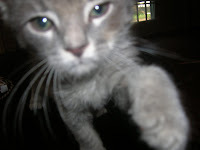 He jumped(walked up a quilt) onto the bed and as Jay Leno began, Willie started to romp on the bed, attacking my feet, hands, etc. At some point I fell asleep only to wake up about an hour later with a comatose cat on my neck! By then the other two were also in bed and sleeping. Spooky down by my feet and Henry in his assigned spot on the pillow by my head. I guess Willie was tired out by his playing so after being moved off my neck, he went back to sleep. Now my only dilemma is his food. He is not eating his kitten food. He would rather eat the big boy food! I give up!! 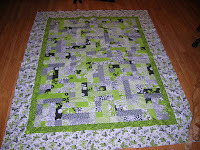 I finished the top for the Cursillo quilt and yesterday finished the backing. Today I am going to take it to PJ for quilting. I also finished the backing for the last year's quilt camp. Gotta get that one done since Shannon emailed me reservation for this year's camp! The top has been done for ages but I just never got around to doing the backing..dah.......! It is another gray day in the Atl and tomorrow and in fact the whole next week does not look much better. I was so lazy yesterday afternoon. I just hung out on the couch with Wild Willie. 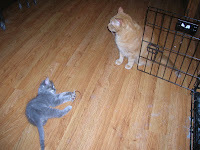 Speaking of same- he has discovered his "borthers" and is beginning to stalk them. no more hissing going on! The Most Exalted Thimbel has posted a giveaway on her blog. That would be Silver Thimble talk. Pat is the bomb...one crazy lady!!!! She is the moderator and sometimes the one in control when we meet. She even has a notion that she can get me to do heinous applique......NOT IN THIS LIFETIME!! I am working on the quilt to send north as a donation to NY Cursillo. I will post a picture when I get the borders on. My plan is to complete it this weekend so that I can get it to PJ before she leaves for Calif. 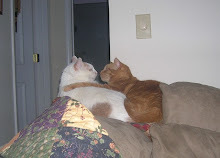 The boys seem to be adjusting to each other. They are actually in the same room at times! Today I decided that I would not crate Willie when I went to work. When I came home everybody had all their parts! I think tonight I may leave him out as well. He has not ventured into the bedroom yet, so maybe Henry and Spooky can sleep in peace. I am not sure that Willie is his final name. But it seems to fit and nothing else has popped up yet. (Yes, Laurie, I know that makes Lillie and Willie but they won't be together that often). My little boy had a good night, I think. I would imagine he missed his sibling. He spent the night in the crate. When I came out into the living room this morning, he climbed up the side and now he is sitting on my shoulder. He is purring to beat the band. He does purr a lot! Spooky finally came into the bedroom this morning at 6AM. He spent the night in the sewing room closet, I guess. Spooky always sleeps at the foot of my bed. I hope he stays in my room to sulk because at least then he has access to food, water and the litter box that is in my bathroom. Henry was in around midnight and after eating left again. 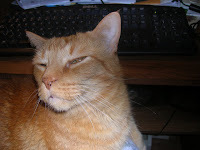 But I have discovered that Henry enjoys the sewing room too. I have a quilt on one end of the table by the window. He likes to watch the backyard from there. Meet my new little boy. He does not have a name yet. We need to live together for a couple of days so we can see what fits. 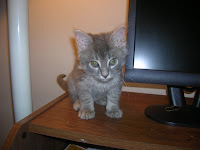 He weighs not quite two pounds and is about 7-8 weeks old. He was born in Walton County and his momma abandoned him. One of my coworkers rescued him and his sister. She and her husband bottle fed them until they were old enough to eat food. (She has already called this evening to see how he is)! Forgot to mention his fur...it is both long and short. It will be interesting to see what he looks like when he is a little older. 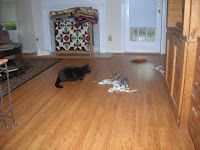 And as for Henry and Spooky? Well Spooky is in the closet and Henry is hiding under the bed in my bedroom. It is going to be a very long weekend I think! -is the quilt inside or on top of the coffin? -if it is inside, is it under or over the dearly departed? -does the quilt get folded up and presented to the family at the internment like a flag? -who is the maker of the quilt? I think these and other questions need to be explored by the group! I just read Gretchen's blog and realized once again. that quilters on the whole are quite a bunch. We did laugh and laugh (and laugh) at Thimbles on Saturday. The Head Thimble was in rare form-watch out Pittsburg, Hurricane Pat is on the way. Poor little town doesn't know what is in store! We will just have to wait for Pat's debut of various qulted items! And then there is our attachment to our four footed family members! Edgar Poe and Stella (and Gomez and Morph)quilt inspectors and sometimes authors...I wonder if Randy will soon want to contribute some of his thoughts? 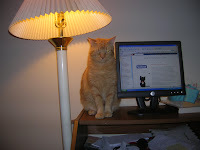 I wonder what we would hear about if Osamma Bendoggie got onto the blog? Spring market starts this weekend and I can't wait to hear about it from both Pat and Melisa. My person got me up at 4AM this morning because she couldn't sleep. 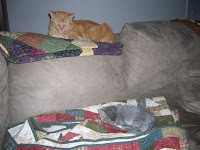 I have no problem sleeping but I am not happy when she disturbs my visions of catnip fields. I need her to get serious about a quilt for me. Everyone else seems to get quilts. I don't think it is too much to ask. I think Gretchen's kids have quilts. I must contact Edgar Poe again. Gretchen blogged about her trip to Sweet Home the other day and showed her goodies. 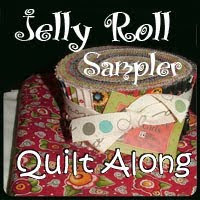 Since then, I have been looking for the latest issue of Quilt Sampler magazine. I even ran into Kristie at B&N the other day. So today I figured I had better high tail it out to Sweet Home before Melisa's were all gone. I got the last copy!!! And of course I wouldn't just get a magazine and leave without checking out what was new. I was drawn to the lime green, black and white fabbies. I promised Kathy that I would make a quilt for an auction for NY Cursillo. I have been thinking about what I wanted to do all week. Now I have the fabric and will have to get started. Also bought the charm squares so Kathy can have a more seasonal bag. Now I need to get sewing. 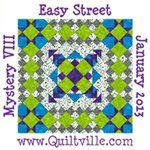 This is a Thimbles weekend and I am so looking forward tobeing with my quilting buds. 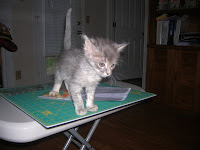 I am going to be working on the Gretchen made me do it quilt! ..but it is good to be home! I had a wonderful few days away. The drive takes about 7 hours-four hundred fifty plus miles but it is all interstates. Kathy lives in a golf community called Pelican Bay. Her house backs up on the fairway close to one of the greens. She has a wonderful screened-in porch and I spent part of the time watching the golfers. So okay-it was not like watching Tiger but still fun. And they cheated!!! Also watched the waterfowl-pelicans,egrets and one called an anhinga. It was a strange bird that would dive for food. When it came up, it looked like a snake coming out of the water. Other than the lovely porch, her home is just great. I could live there-if it came with daughters and grandchildren! Her sister lives in the same community and we had a great time together. Daytona Beach was wonderful too. I did get a burn but it is already improving. The water was still tooo cold for old ladies to go into except up to the knees. We also looked at how the others live along the ocean front. Not too shabby! And of course no trip would be complete without checking out the Speedway. We didn't go in but drove all around it. Kathy lives not too far from there. Only downside of the trip was no fabric shops...like I need more fabric. Now it is back to work tomorrow!